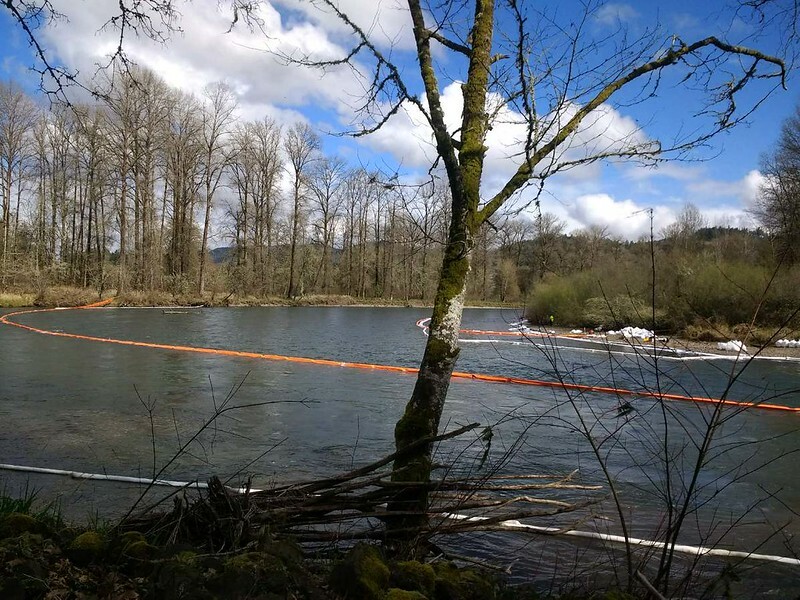 International Paper will clean a 2-mile-long pipe from which hydraulic oil spilled into the McKenzie River last week, state Department of Environmental Quality officials said Friday. DEQ officials said it became clear that the entire pipe needed to be cleaned with high-­pressure water jets, after a series of test operations showed that flow rates from the pipe could not be increased to normal levels without creating a sheen on the river near Hayden Bridge. The oil-tarnished pipe — which typically discharges treated wastewater into the river — should be cleaned by sometime early next week, DEQ officials said. They said the cleaning process will produce water that vacuum trucks recover and take to the mill for treatment. No water from the pipe will empty into the river during cleaning, according to the DEQ, which will oversee testing of the pipe after cleaning is completed. DEQ officials consider the incident an unauthorized spill that isn’t covered by the mill’s discharge permit. An investigation is continuing. Meanwhile, Lane County on Friday reopened the Bellinger and Hendricks Bridge boat ramps upstream from the oil spill site. County officials opened the ramps after floating barriers — which have been used to absorb and contain the oil — were removed at the spill site, which is just 800 feet downstream from the Eugene Water & Electric Board’s water intake facility. EWEB uses the river for Eugene’s water but said last week’s spill resulted in no threat to drinking water that serves the area. While the river is now open to boat traffic, the Hayden Bridge boat ramp remains closed until further notice, county officials said. They cautioned boaters to steer clear of other equipment that still is in the river near the spill site. It is also rumored that the March Brown hatch has relocated itself above and below Hayden boat ramp area! Anglers should be aware the March Brown hatch is well underway and fishing above has been good! With warmer weather and sunny skies predicted early next week, its a sure bet the hatch will be very good. Also, the middle fork and main stem of the Willamette will be a good bet for anglers. Keep a keen eye on all river levels as recent rain and snow will cause an increase in flows but once they drop….the fishing should be quite good. For those seeking chrome, reports have been fair for late arriving winter steelhead on coastal streams. A great time to swing!